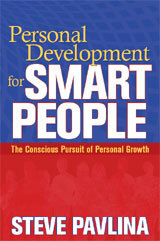 Now here’s a surprise — my book Personal Development for Smart People has launched early. The original release date was October 15th, but the book has already shipped and is available now. You can get it at Amazon.com and in many major bookstores, including Borders, Barnes & Noble, Books a Million, and Hastings. The major book distributors also have it too, including Baker & Taylor, Ingram, Partners, Bookazine, and New Leaf. So if your local bookstore doesn’t carry it yet, it should be easy for them to order it if you request it. The early launch was actually a mistake. I learned of it last week when people started telling me that they’d just received their pre-ordered copies from Amazon. That was news to me! I checked the Amazon sales page for the book and saw that it was no longer in pre-order status — it was already selling. Once that happened, the book’s Amazon sales rank quickly climbed into the top 1,000. And I hadn’t even announced the release yet. I promptly contacted Hay House to find out what happened. Apparently the book was supposed to be shipped from the printer to their warehouse, and then it would be shipped to their distributors shortly before the launch. But instead, thousands of books were shipped from the printer directly to the distributors and retail chains, who promptly began selling them. If you’re a blogger who took advantage of my review copy offer, there’s no need to wait until October to post your review. Please feel free to review the book as soon as you get a chance to read it. If you email me a link to your review via my contact form any time between now and October 31st, I’ll be happy to add a link to your review. I’m going to do this in batches. About 420 bloggers have already been approved for review copies, so that’s a lot of reviews. The review copies began shipping last week, so please be patient if you haven’t received your copy yet. Most reviewers will receive a print copy in the mail. But there were a lot of requests from international bloggers, and it was a challenge to find a fair way to qualify them. Hay House wanted to disqualify almost all of these requests because many of the international blogs were in languages or countries where the book isn’t even available yet, and Hay House wants to focus on the U.S. launch. Many of these requests also came from countries where the mail system is unreliable, such as parts of Eastern Europe. And on top of that, many international bloggers said they preferred an electronic version of the book, so they could get it sooner. I still wanted everyone to get a print copy, but Hay House has to pay for this, and shipping hundreds of books internationally isn’t cheap. After some discussion we ultimately decided to send the international bloggers a PDF version of the book, but if their traffic was high enough (we had to set the bar fairly high), Hay House would still mail them a print copy. Maybe this wasn’t a perfect solution, but I think it was a fair way to handle it. The alternative would have been to disqualify most of the international review copy requests. But this way, nearly everyone who requested a review copy will receive something — either a print copy or a PDF. If you received the PDF but don’t like reading on your computer screen, you can always print it and read it on paper. I don’t know too many people that read long e-books on their screens. If you didn’t participate in the free review copy offer but would still like to review the book on your website or blog, I’ll link to your review if you send me a link to it… as long as it has some decent substance to it and doesn’t just rehash the back cover text. I’m not possessive about the ideas in the book — I really want them to spread. I’d love to see people writing about other ways to apply the book’s 7 principles to specific challenges and situations. Put your own creative spin on it. Several bloggers have already posted reviews and have sent me the links. I’ll be sure to link to these reviews soon. I’m just waiting for a few more to come in so I can do this in batches. I still have about two dozen interview requests to process, so if you requested an interview, please be patient. I’ll endeavor to reply to all of the requests I’ve received so far by the end of the week. As you can imagine, this is a pretty busy time for me.